Each adventure in Sierra's Hi-Res series has a number associated with it, given in the order in which they were written. Cranston Manor is #3. This is the earliest Cranston package I have, the small Online Systems folder used before the company changed their name, and their packaging along with it. 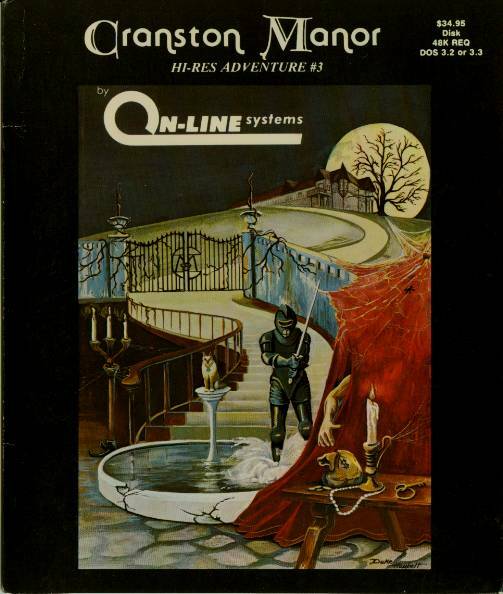 The large Sierraventure folder has a different cover with a closeup of the suit of armor. Presumably the later box package shares the same artwork. There may also be an earlier Online Systems folder printed on thick yellow paper, as with Wizard and the Princess.